Who qualifies for an American University / College golf scholarship? Only the best young players will be considered for a Women’s Golf Scholarships. If you have a golf handicap of 3 or below and you are a regular winner or low scorer of your club’s junior tournaments, then you could well be looking at gaining a substantial US College Women’s Golf Scholarships offer. American University / College golf coaches will often request references and DVD ‘swing analysis’ evidence from county coaches etc. Sporting Chance USA can help you provide this evidence. So if you are a county standard player or possibly a nationally ranked player, then we would like to hear from you. In return we can guarantee that we will be contacting numerous selected US College golf coaches on your behalf. Sporting Chance USA has an excellent working relationship with numerous US golf coaches and we are constantly being asked for exciting new UK talent for Women’s Golf Scholarships. If you are considering going to university within the next 12-24 months whilst at the same time progressing your golfing career, then a US College golf scholarship could be the right move for you. Many young UK golfers move to the US safe in the knowledge that they can select their programme of study from a wide ranging choice of subjects. Many choose to study on the PGM (Professional Golf Management) programmes that are available in colleges throughout the USA. All US Colleges have well respected and learned golf coaches in charge of their individual programmes. These programmes are very much learner centred and the social, academic and sporting development of each individual is paramount. Another major factor in choosing to attend a US College are the fantastic facilities that are on offer to aspiring young athletes. Many US Colleges have their own first class golf courses on campus. 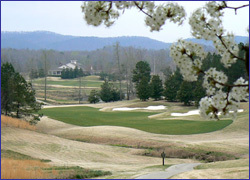 They also enjoy regular use of some of the finest golf courses to be found in the USA. How much can you expect to receive if you are successful in gaining a US scholarship? An annual US College programme will normally cost between $20,000 – $35,000 before a scholarship award. If you are successful in obtaining a scholarship award, this can reduce the cost to between $6000 – $10,000. It must be noted that a US University / College scholarship will normally include the cost of tuition fees, on-campus insurance, accommodation and food. This figure compares favourably to the cost of attending a UK university, as it has been announced that most UK students attending a UK university can expect the cost to be £15,000 plus when accommodation and food is taken into consideration. Unfortunately student loans are not available to UK students who decide to study abroad. Also US College grants are few and far between and should not be relied upon. This is a typical video that may be viewed on each athlete’s profile.